Bookreporter.com: Another year, another Rick Cahill dilemma --- the perfect gift to put under the Christmas tree. How has Rick evolved? Matt Coyle: That is an excellent question, though not easily answered. I’m not sure if Rick has evolved or devolved through five books. When I realized I was writing a series, I wanted each decision and action he took to matter, to have consequences. 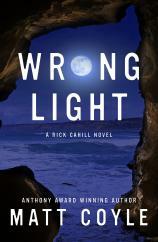 So, by the time we get to WRONG LIGHT, Rick has suffered a lot physically and, more damaging, emotionally. All of that trauma informs his decisions and not always beneficially. BRC: What inspired radio talk show host Naomi Hendrix being stalked, as the crux for WRONG LIGHT? MC: I’ve listened to talk radio, in various forms, for 30 years. The first shows I heard concerned callers talking through their problems, and I wondered how a contemporary charismatic host would handle that. Thus sprung Naomi. A friend who’s been in talk radio for 25 years told me about some threats he and other hosts received. Ergo the plot for WRONG LIGHT. BRC: Rick seems to have reached a breaking point. Russian mafia thumbscrews can do that. What inspired the characters Tatiana and Sergei Volkov? MC: They came from necessity in another book. Writing a scene, as often happens, an idea popped into my head, and I added it not knowing exactly what it meant or if I’d keep it upon revision. In the scene, Rick confronts his old nemesis, Peter Stone, over something he thinks Stone did. Stone realizes, however, that it was someone else, and he appears to Rick to be shaken by this. I had no idea at the time who “the someone else” was. I had to contemplate who could make Peter Stone, the nastiest, most powerful person in Rick’s universe, nervous. Then it came to me: the Russian Mob. Tatiana and Sergei stayed in the other book and showed up in this one, too. BRC: According to this link, Volkov is a Russian surname derived from volk, meaning “wolf.” Is this intentional, given that Tatiana and Sergei are as vicious as wolves? MC: Unintentional, but kismet. I wanted a Russian surname and chose Volkov. Not until I researched to assure it was Russian that I discovered the wolf meaning. Perfect! BRC: Rick’s quest for the truth saw a friendship end with Kim Connelly. The same seems destined for compatriot PI Moira MacFarlane. Will Rick get the hint, or does an omnipotent umpire call strike three? MC: Moira has become an important person in Rick’s life. Really, the most important. She’s his best friend and, maybe, his only true friend. He relies on her in more ways than he knows. Her reasoned behavior is an important counterbalance to his (sometimes manic) quest for the truth. No spoilers here, but the actions Rick takes in WRONG LIGHT pushes their friendship toward the breaking point. BRC: I’ve been a Rick Cahill addict since page one of YESTERDAY’S ECHO. What’s in store for Rick in the next outing? MC: Great to hear. Thanks. After tackling the truth about the demise of Rick’s father in BLOOD TRUTH, Rick will finally learn who killed his wife in the next book, LOST TOMORROWS. I’m still not finished, but I think the title will stick. It’s the earliest I’ve ever come up with a title. I don’t know if that’s good or bad, but it does relieve one pressure. BRC: Your website identifies many awards and nominations you’ve earned, not “won” like trinkets at a county fair. What other honors have you earned since the 2017 interview? MC: My last book “earned” the Indie Book of the Year Silver Award for Mystery/Thriller from Foreword Reviews and was a finalist for the Lefty and Shamus Awards, and, proud to say, made Bookreporter’s top books of the year list. BRC: You will be the Left Coast Crime San Diego 2020 convention Toastmaster. BLOOD TRUTH and DARK FISSURES were Lefty Award finalists. Please educate those on the other coast, and in between, about the significance of the Lefty Awards and Left Coast Crime. MC: I’m thrilled that Left Coast Crime in 2020 comes to my hometown, San Diego, and the city I write about. I’m honored to have been asked to be Toastmaster. Left Coast Crime is a smaller version of Bouchercon, a mystery fan conference with great guests of honor and fun, informative author panels. Our guests of honor are a couple of fantastic authors and engaging speakers, including T. Jefferson Parker and Rachel Howzell Hall. Like Bouchercon, LCC has its own awards in various categories, called the Lefty. I expect that being in San Diego in early spring, LCC 2020 will be one of the most attended in its history. Can’t wait! BRC: Thank you for a thrilling read, and this interview. It’s open mic night. Final thoughts? MC: Thanks for the interview. I enjoyed it. Your readers may not know that I host a podcast called "Crime Corner with Matt Coyle" on Authors on the Air Global Radio Network. I get to interview other crime writers, and we talk about writing mysteries, true crime and life. It’s a lot of fun, and I’m fortunate enough to have a great group of intelligent, dedicated listeners. Matt Coyle’s events calendar is at this link. The award-winning author’s appearances for early 2019 are at various locations in Texas, California, Alabama and Seattle.